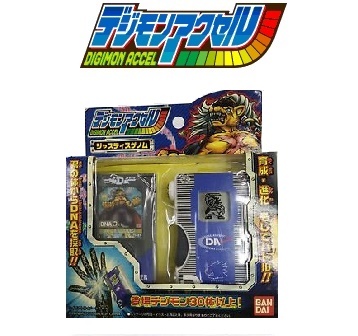 Digimon Accel Justice Genome (デジモンアクセル ジャスティスゲノム) alongside with the Digimon Accel Evil Genome is the first wave release of the Digimon Accel Virtual pet. Frimon: Dragon 0-5, Insect/Plants 0-5, Beast 20. Frimon: Beast 0-5, Insect/Plants 0-5, Dragon 20. Frimon: Beast 0-5, Dragon 0-5, Insect/Plants 20. Frimon: Insect/Plants 0-5, Beast 11-15, Dragon 20. Frimon: When you do not fulfill the requirements of other Digimon. Frimon: Insect/Plants 0-5, Dragon 11-15, Beast 20. Liollmon: Water 0-5, Holy 11-15, Beast 20. Patamon: Bird 0-5, Holy 11-15, Beast 20. Agumon X-Antibody: Insect/Plants 0-5, Holy 11-15, Dragon 20. Piyomon: Bird 0-5, Holy 11-15, Dragon 20. Kokabuterimon: Beast 0-5, Insect/Plants 11-15, Dragon 20. Otamamon: Insect/Plants 6-10, Water 6-10, Dragon 20. Kokabuterimon: Beast 0-5, Dragon 11-15, Insect/Plants 20. Agumon X-Antibody: Holy 0-5, Dragon 11-15, Insect/Plants 20. Otamamon: Water 0-5, Dragon 11-15, Insect/Plants 20. Piyomon: Holy 0-5, Dragon 11-15, Bird 20. Kokabuterimon: Insect/Plants 0-5, Beast 11-15, Dragon 20. Patamon: Beast 0-5, Holy 11-15, Bird 20. Otamamon: Insect/Plants 0-5, Water 11-15, Dragon 20. Liollmon: Holy 0-5, Beast 11-15, Water 20. Patamon: Bird 6-10, Beast 6-10, Holy 20. Piyomon: Dragon 6-10, Bird 6-10, Holy 20. Agumon X-Antibody: Insect/Plants 6-10, Dragon 6-10, Holy 20. Liollmon: Water 6-10, Holy 6-10, Beast 20. Liamon: Water 0-5, Holy 11-15, Beast 20. 50% or more Win Ratio. Revolmon: Dragon 0-5, Holy 6-10, Machine/Mutant 20. Aquilamon: Bird 0-5, Holy 11-15, Beast 20. Greymon X-Antibody: Beast 6-10, Holy 6-10, Dragon 20. Revolmon: Dragon 6-10, Holy 6-10, Machine/Mutant 20. Coelamon: Water 0-5, Beast 6-10, Machine/Mutant 20. Blade Kuwagamon: Water 0-5, Dragon 0-5, Insect/Plants 20. Aquilamon: Beast 6-10, Holy 6-10, Bird 20. Pegasmon: Holy 0-5, Bird 6-10, Beast 20. Pegasmon: Beast 0-5, Bird 0-5, Holy 20. Liamon: Water 0-5, Beast 0-5, Holy 20. Greymon X-Antibody: Beast 0-5, Holy 0-5, Dragon 20. Coelamon: Water 6-10, Machine/Mutant 11-15, Beast 20. Blade Kuwagamon: Water 0-5, Dragon 6-10, Insect/Plants 20. Loader Liomon: Holy 6-10, Machine/Mutant 11-15, Beast 20. 80% or more Win Ratio. Chimairamon: Machine/Mutant 0-5, Dark 6-10, Beast 20. Metal Greymon X-Antibody: Beast 0-5, Machine/Mutant 11-15, Dragon 20. Volcdramon: Dark 0-5, Machine/Mutant 11-15, Dragon 20. Loader Liomon: Beast 0-5, Machine/Mutant 11-15, Holy 20. Metallife Kuwagamon: Beast 11-15, Water 11-15, Insect/Plants 20. 60% or more Win Ratio. Dagomon: Beast 0-5, Water 11-15, Dark 20. 60% or more Win Ratio. Garudamon X-Antibody: Dragon 6-10, Holy 11-15, Bird 20. Holy Angemon: Water 6-10, Holy 11-15, Bird 20. All Perfect Digimon: When you do not fulfill the requirements of other Digimon.